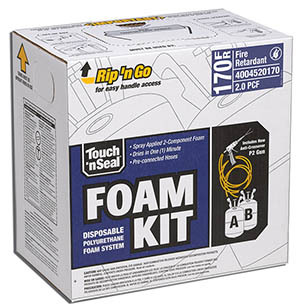 Touch 'n Seal 2.0 PCF foam is designed for use in both commercial and recreational watercraft. In addition to being approved by U.S Coast Guard for Marine Use (Title 33 CFR, Paragraph 83.114), this foam offers increased structural strength, superior sound control, and excellent thermal insulation. Foam Kit 170 is a self-contained two-component foam system that is portable and disposable. It comes with pre-attached hoses and ergonomic foam applicator. The Foam Kit 170 provides up to 170 square feet at 1" thick, equivalent to over 14 cubic feet of 2.0 PCF foam. In addition to this foam kit, the 2.0 PCF formula is also available in both CPDS Foam Kits (CP-600) and Refillable Systems (RF-17, RF-60, and RF-120).